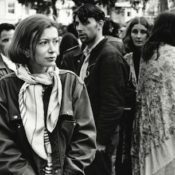 Joan Didion is a writer of novels and literary journalism. Her best known works include Slouching Towards Bethlehem, Play It As It Lays, and The Year of Magical Thinking. Didion's Slouching Towards Bethlehem appeared in the September 23, 1967, issue of the Post.